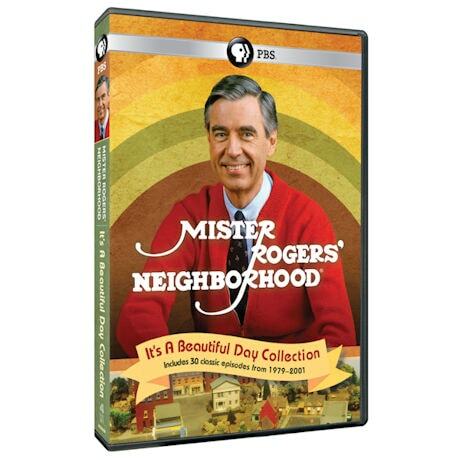 Celebrate the 50th anniversary of the beloved Mister Rogers' Neighborhood. Generations of kids have grown up watching his daily television shows. 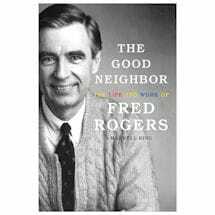 Filled with real-life guests, interesting field trips, and charming make-believe segments, each episode of Mister Rogers' Neighborhood helps children learn the importance of being kind to others, appreciating what makes everyone unique and special. 32 episodes, 14 ½ hrs, 4 DVDs. In the Neighborhood of Make-Believe, Prince Tuesday, Daniel Tiger, and Ana Platypus begin their first day of School, where there is time for learning and for play. Visiting storyteller Jay O'Callahan tells a story of "Bubble Trouble." In the Neighborhood of Make-Believe, opera star John Reardon offers to write a new opera. 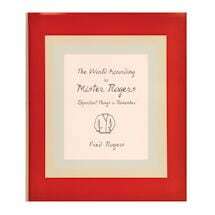 Mister Rogers talks about loud play and quiet play, and all the different ways there are of playing. Mister Rogers visits the National Zoo in Washington, D.C., where he helps prepare food for the giant pandas. Mister Rogers explains that building friendships is similar to building bridges. Although friends often have hard or sad times, they can also build a stronger friendship each time they are together. Folk singer Ella Jenkins visits Mister Rogers and sings and plays a song on a harmonica. Mister Rogers has a Neighborhood board game with the different Make-Believe neighbors. In the Neighborhood of Make-Believe, a new flying trolley comes with a message that Collette, Grandpere's granddaughter, will be coming for a visit. Mister Rogers tells viewers that there are many different kinds of food—food for the eyes, for the ears, and for the spirit. Mister Rogers' visits Tim O'Horgan who shows viewers his collection of unusual musical instruments. Mister Rogers shows a film of a bird family, and talks about how there are many different families of birds, just like there are many different families of people. Mister Rogers has a celebration in honor of his young television friends saying, "The world can be a better place because you were born into it." Mister Rogers visits a toy lending library and sees children playing with different kinds of toys. Mister Rogers, with the help of his ventriloquist dummy, learns that sign language and talking can be two different ways of saying the same thing. In the Neighborhood of Make-Believe, Broadway superstar Tommy Tune enchants the Neighbors with his dancing and his kindness. Mister Rogers deciphers an invisible ink note from Mr. McFeely and shows a video of how people make suitcases. Mister Rogers and Mr. McFeely go bowling where they not only have a chance to bowl, but also to see how pins and balls are set up. Mister Rogers makes a puppet show using boxes and materials that would have been thrown away. Mister Rogers brushes his teeth in his bathroom and talks about how important it is to take care of our teeth, and even visits a dentist's office! Mister Rogers plays dress-up with wigs and glasses, and in Make-Believe everyone is looking for the King's lost crown. In art, you can make things any way you want. Mister Rogers shows slides of some famous masterpieces and talks about visiting art museums. Elevators and escalators - Mister Rogers shows some toy machines, and rides on real ones that lift people and cars. When Lady Elaine forgets her lines during a play, she is assured that people will still love her! Mister Rogers shows a photo book of twins and explains that even though identical twins look alike, each one is unique. Looking carefully can help children with growing and learning. Mister Rogers has a purple flowered plant and takes time to look at it closely! Mister Rogers meets with some children who are making crafts at the Inner City Art Center in Los Angeles. A hula hoop expert, Paul Tifford, gives Mister Rogers some lessons. Falling and getting up again are a part of learning, both for toddlers and for most things in life. Author/illustrator Eric Carle gives Mister Rogers and viewers a "gift" when Mister Rogers visits him at his studio and he shows how he created the art for his book, "From Head to Toe." Mister Rodgers reads a book about a dog named Zak. There's also a video visit to the Center for Creative Play, a place where children of all abilities can play. In Make-Believe, H.J. Elephant feels more confident because he can read sign language and so he agrees to be on Lady Elaine's Reading Game Show. Mister Rogers encourages his "television friends" to appreciate the wide variety of art at the Neighborhood of Make-Believe's arts festival!